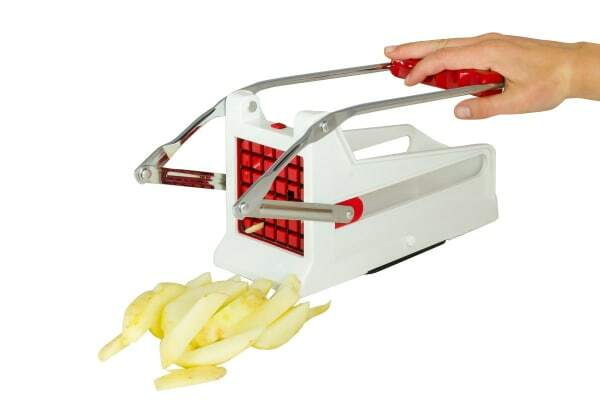 Slicing perfectly even fries can be tedious and take an annoyingly long time, but with the EasyCook Jumbo Potato Chip Cutter with Suction Base, you can create the perfectly cut french fries at home quickly and effortlessly. Take the hassle out of slicing consistently even fries at home with the EasyCook Jumbo Potato Chip Cutter with Suction Base, an ingenious appliance that evenly cuts chips with a push of the handle. 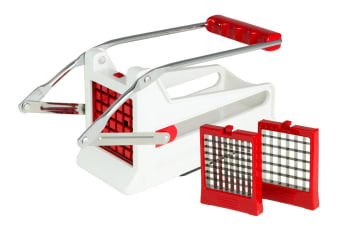 The cutter features two razor-sharp blade grids that rapidly slice ingredients to create your perfect steak cut or shoestring fry in a flash with a fraction of the effort. Plus, not only are homemade fries cheaper than store bought, but you know exactly what’s going into them, so they taste better and feel healthier. Simply pick the gird according to your desired fry size, place the potato in the chip cutter, press the handle and they’re ready to cook. You can even get creative with the cutter and use a variety of vegetables, including zucchini, sweet potato, apple or carrot! Plus, if you accidentally cut too many, you can pop the extras in the freezer until you’re ready to chow down next.